I am walking down a trail in the ancient Adirondack Forest. I pull my wide-brimmed hat to better cover my eyes against the sudden spring rain. I wipe the sweat from my forehead and swat at the blackflies. I shuffle the rotting crimson and yellow leaves to one side. I monitor my steps carefully because of the six inches of fresh snow. I am walking with one of my two loves I met in my youth. I first enjoyed the Adirondacks as a child of five. Family camping trips slowly gave way to long and impossible hikes in the High Peaks. 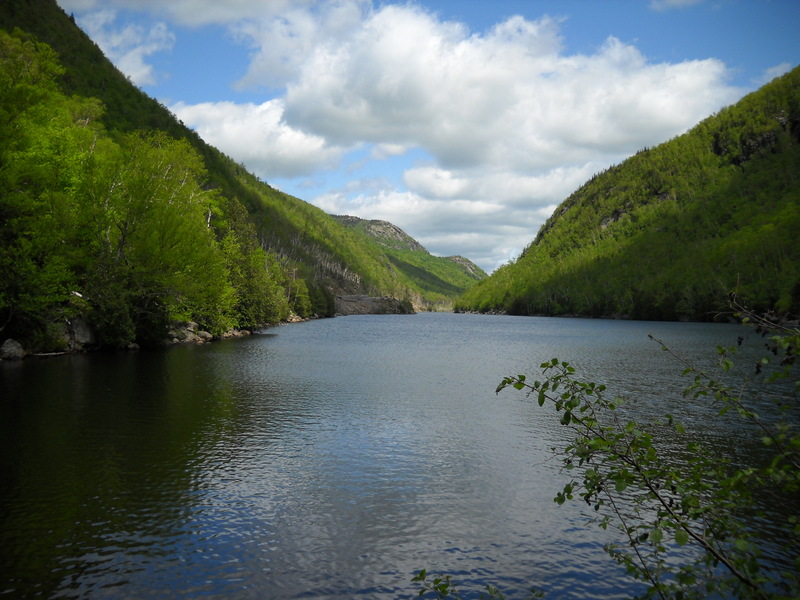 This led to the canoe routes of the St. Regis Wilderness Area and solitary paddling on the Saranacs. I am still with this lover of mine; these trails, ponds and bogs. I live among them now. I have gray hair. My other lover is not someone that I feel comfortable using mere language to describe. She was and still is part illusion, part myth and wholly real. She is made of flesh and blood like any other woman. You see, as an adolescent, I encountered a Mountain Nymph. I did not, truthfully, actually “meet” her but only saw her half hidden in a midnight shadow while she slept against the wall of a State Forest Ranger cabin. I was standing in the dark with my brother, whispering to the ranger about the nearest empty lean-to. He played his flashlight beam onto a pair of bare and mud covered feet. “That’s Monica,” was all he said. Beside her was a full Kelty pack and a pack basket strapped across the top. I was up early but when I walked over to the cabin, Monica was gone. She had continued on to an even more remote cabin. The ranger said she left about two hours earlier, just at the breaking of the dawn. This young woman who hiked alone, barefoot and carried a load that I would find impossible to manage, intrigued me. As I climbed the High Peaks and hiked the myriad of trails around and over Marcy, I would, on occasion, hear the name of Monica. Years went by and I kept learning about the epic exploits of Monica. Then, in the early 1970’s, I stopped hearing her name mentioned in trailside conversations or spoken of around campfires. My friend and hiking companion through those years and I began to build up our own mythology of Monica. She became our Mountain Nymph. We would imagine her waiting for us beside a small mountain pond with a cup of cold water, sitting on a rock beside a roaring flume. She always would promise us comfort. She would offer us succor, a lap, a hand, a shoulder and most of all, love. And escape, of course, for isn’t that what Nymphs do, offer escape from the ordinary to take us up to the lofty peaks of the extraordinary? Wasn’t it her role to lead us to the Land of Dreams and offer a glimpse of what was possible for our poor hearts to attain? For many years I stopped visiting the Adirondacks. My companion and I went in separate directions. We grew into middle age…and then beyond. We lost our dreams somewhere along the way. I came to realize that an alluring goddess, lying on the heather of a summit or sitting on a bed of moss, was not responsible for when and how my heart and head needed to grow. I internalized Monica. I grew up. For many years I thought how wrong I was in trusting my spiritual growth to someone who only existed as an amalgam of realism and myth-making. I became acutely aware of my own role I must play. But these realities were becoming sterile to me. Something was missing. I had found a golden ball in my youth and I lost it. I began spending precious time trying to find it again. The magic of the summits paled and the sky became merely something over my head, something to keep an eye on in order to stay dry. Rocks of the peaks and stream banks became burdensome and annoying. The magic was gone. I had learned to take my spirit into my own hands and mists became only water vapor. To be really cold was a matter of survival and to be really hot was exactly the same, you just took different medicines. Now, I regret my losses. In the end, what is really wrong about needing a spirit guide, a kindred soul, and a belief, a Nymph? Throughout human history, something or someone extraordinary walked beside a man, guiding and comforting. This journey we are all part of can be unbearable lonely at times. Maybe I need a Monica again? I am walking along a trail in the ancient Adirondack Mountains. I am sitting on a rocky summit. What is that I just saw dash between the scrub pines? What just touched my elbow as I struggle to rise again and continue my hike? Who was that making a shadow among the old cedars in the dark part of the forest where there are already shadows plenty? Whose bare shoulders do I see at the water’s edge as I survey the shore from my kayak? You can’t convince me that the song I hear is the wind in the fir trees. Those who lived within earshot of the railroad would usually be put to sleep by the clacking of the iron wheels passing over the rail joints. It was an age-old rhythm, a song often without words. It drew the listeners away from their world. Where was the train bound? Where did it come from? Hank, Woody, Eric and Bob…and a hundred others heard the music. With the advent of seamless rails, the music has stopped. More than one lonely and desperate man or woman or kid would rise up…get dressed, and vanish with the train when it slowed or stopped. Sometimes they came home, most often they didn’t. The iron wheels were the call of the wild and the restless answered. A true listener could easily tell if the train was on a freight or passenger run. Was the sound light, full of people or was it dark, heavy and full of coal, or steel or logs? 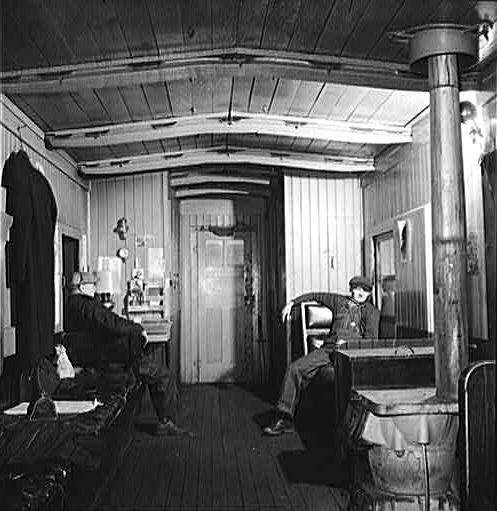 On the freight lines, a breed of men rode the train in a car at the far end, the caboose. Here, swaying and rocking to the subtle changes in directions, these hardened and unshaven men would sit and wait for the next stop. In the winter, they would sit near the coal stove to fight off the icy blasts of a Missouri winter. In the sultry summer, aching to breath moving air, they would sit in the open of the platform that was the last true end of the train. One might page through a cheap copy of a girlie magazine. Some sat quietly and read from the Bible. They played cards. They napped. They slept, rocking like a baby they barely recall seeing, holding or being. Usually, though, in the hours after midnight, one fellow would reach into his sack and pull out a bottle of pitiable rye. The bottle would be passed…no wiping needed. Somewhere along the line, a home waited for these souls. A wife, a lover, a lonely son, a daughter about to run away with a worthless dishwasher, a mangy dog and a kitchen with plastic table cloths. Some went to nothing more than a small 12′ x 12′ rented room in a boarding house that needed painting, on a side street not far from the station, hard by a saloon. A man or two might not get off at all. In some town, any town, there were warrants for his arrest. He would ride on, change shifts somewhere and disappear into the night. Many of these men who were short in the cash and honesty department could hold no real job or own a skill. One skill they all did have was the ability to stare into ones eyes or a camera lens without blinking or grinning. They could not know someone decades later would stare back at them. My father grew up poor. Not the kind of poor where he would walk through ten inches of snow barefoot or go from house to house asking for bread. His parents provided the best they could, but, by his own admission, he grew up poor. My grandfather and my grandmother should be telling this story. Instead, it came to me from my own dad and it nearly always came to me around Christmas when it was cold and snowy. Winters were like that in those years, always cold and snowy. It was Northeastern Pennsylvania. It was coal country and my grandfather was Irish. All three generations went down into the mines, every day, before dawn and surfaced again long after the sun had set. Because of some misguided decision on his part, my grandfather was demoted from mine foreman to a more obscure job somewhere else at the pit. Later in life, he fell on even harder times and became depressed about his inability to keep his family, two boys and two girls, comfortable and warm. It all came crashing down when their simple farm-house burned to the foundation. After seeing his family safely out, all my grandfather could salvage was a Hoover. My father could describe in minute detail how he stood next to his dad and watched him physically shrink, slump and then become quiet. He never broke the silence after that and died in a hospital while staring mutely at the walls. But all this happened years after that special Christmas Eve. It was in the early 1920’s. The four children were asleep in the remote farm-house my grandparents rented. Sometime after mid-night, my father woke up to a silence that was unusual and worrisome. It was too quiet. There were no thoughts of Santa Claus in my father’s mind that night…the reality of their lives erased those kind of dreams from his childhood hopes. There was no fireplace for Santa to slide down. He slipped on a heavy shirt and pushed his cold feet into cold shoes and went down stairs to the kitchen where he knew his parents would be sitting up and keeping warm beside the coal stove. The room was empty and the coal stove was barely warm. The single electric bulb, hanging from the ceiling was turned on. My father noticed the steam of his breath at each exhale. He called out. He heard nothing. Shuffling over to the door, he cracked it open to a numbing cold flow of outside air. In the snow there were two sets of footprints leading down the steps and then behind the house. He draped a heavier coat over his shoulders and began to follow the prints. They led across a small pasture and through a gate. From there the trail went up a small hill and faded from his sight. He followed the trail. Looking down at the footprints he noticed that they were slowly being covered by the wind driving the snow into the impressions. A child’s fear swept over him. Were the young kids being abandoned? It was not an uncommon occurrence in the pre-Depression years in rural America. At the top of the hill, he saw a faint light from a lantern coming from a hole near the side of the next slope. He pushed ahead and went to the edge of the pit…and looked down. At the bottom of the small hole were his parents, picking fist sized lumps of coal from a seam that was exposed on the hillside. They had nearly filled the bucket with the chunks of black rock. They looked up, quite surprised, and saw my father standing a few feet above them. They looked back at each other with a heart breaking sadness. They didn’t want to be caught doing this in front of one of the kids. They stared at each other and then up at my dad. My father hopped down and in only a few minutes his hands were black from the coal. The bucket was filled. They helped each other out of the pit and walked back to the house together. In a very short time the coal stove was warming up again. My father sat up with his parents until they finished their coffee. He went up stairs to bed and fell asleep, he always would say, with a smile on his face. Years later when I was a young boy, my father took me aside one Christmas Eve. I had not been very good that day, and I was afraid. No one, however, had spoken of The Threat that would punish naughtiness.